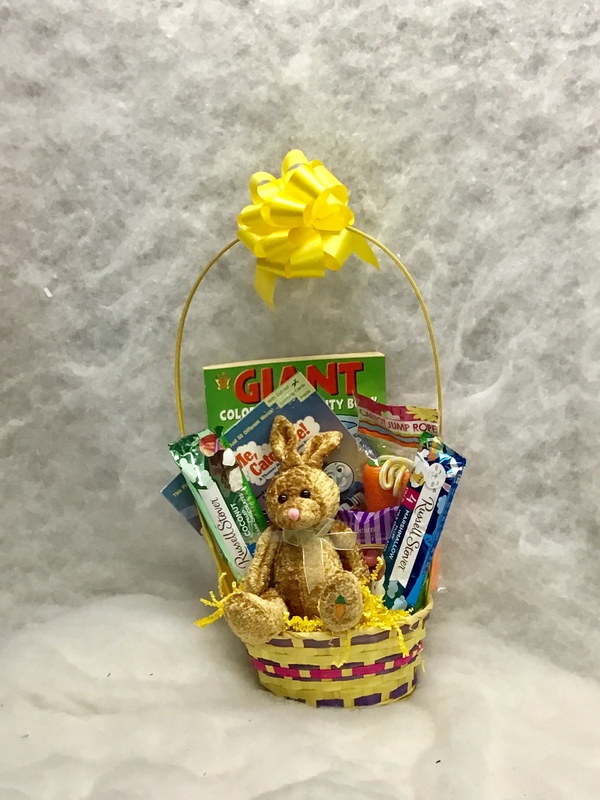 Products may be substituted with equal or greater value, and we can customize any gift basket. This beautiful basket can feed a large office or family. It contains a Tub of Dark Chocolate Covered Cherries, Tub of Dark Chocolate Covered Macadamia Nuts, Peppermint Bark, Tray of Shortbread Cookies, Santa Boot filled with Holiday Candy Corn, Chocolate Covered Potato Chips, Dill Ranch Pretzels, 25 Day Holiday Chocolate Calendar, Two Chocolate Crispy Bars, Wedding Cookies, Box of English Toffee Bark, Cheese Straws, Snowman Chocolate Sucker, Chocolate Chip Cookies and Chocolate Covered Orange Slices. This basket has it all. An adorable “Love You” container filled with Chocolate Hearts, Strawberry Cheesecake Fudge, Pink Champagne Sucker, Chocolate Covered Cherries, Assorted Chocolates, Chocolate Marshmallow Heart, Truffles, Key Lime Cookies, and a Stuffed Teddy Bear will melt your Sweeties heart! Wrapped in cellophane and finished with a bow. $49.95 We will customize any basket for your Sweetie! Welcome to the Gifts of Distinction web site where you will be introduced to many of the creations we design and produce for our valued customers. Our record of providing new, creative and award winning designs was awarded at the Boston, MA Jubilee Gift Basket convention and awarded Best of Show for our Swinging to Success basket creation in Rosemont,IL. We meet and exceed expectations of all our Clients, thus Customer Satisfaction is our base for success. I would highly, highly recommend using Gifts of Distinction! We are always extremely pleased with the results, and our employees love them. Sometimes I think it's not fair when I send one of Vicki's gift baskets. I call her, she does all the work, but I get all the credit. My gift recipients always tell me how much they appreciated my efforts to put together such a nice personalized gift basket. But, all I did -- was call Vicki at Gifts of Distinction. As a small business owner our reputation depends upon the people who represent us to our customers. Vicki Baker’s Gifts of Distinction baskets have always impressed our customers. We as business owners have also been constantly impressed by Vicki’s professionalism, courtesy and artistry in her high-quality service and the beautiful baskets she produces. We will always choose Gifts of Distinction as the best way to thank our loyal customers.